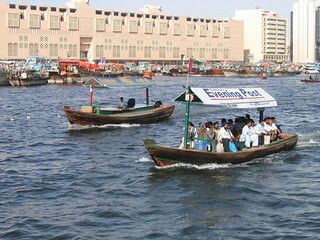 Traffic in Dubai is terrible, and there are relatively few bridges, so many people take these water taxis across the creek. On the left is an empty one--on the right is one nearly full of passengers. The fare is only half a dirham (a dirham is worth just over 25 cents US).